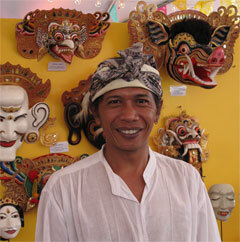 Balinese master mask artist Ida Bagus Anom Suryawan in Santa Fe, NM. July, 2011. (Photograph © Anthony Hart Fisher 2011). 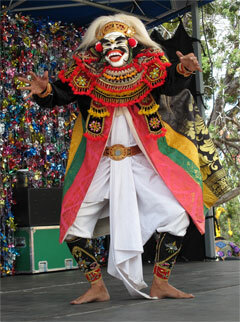 Ida Bagus Anom Suryawan in performance in Santa Fe, NM. July, 2014. (Photograph © Anthony Hart Fisher 2014). Ida Ayu Kumalayoni in Santa Fe, NM. July, 2014. (Photograph © Anthony Hart Fisher 2014). 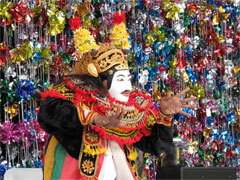 Ida Bagus Anom Suryawan in performance with Dalem mask in Santa Fe, NM. July, 2014. (Photograph © Anthony Hart Fisher 2014).